Electricity is only as useful as the ability to measure it. Too much, and the lights burn out; too little, they go dim. In the great rush to wire the United States during the late nineteenth century, the ability to generate electricity far outstripped methods for measuring and regulating its flow. All early electrical engineers faced the problem of how to determine how much juice they had, and how much they were selling, or giving away. A Weston station meter from the 1880's. Some of the earliest meters were stunningly primitive: in the first years of his Electric Light Company some of Thomas Edison's station meters (the meters that measure the flow out of the power station) consisted of a nail hanging from one of the wires. The nail moved in reaction to the magnetic field generated by the wire, and the men running the station simply watched the angle of the nail to make sure that the flow was right. Edison's meters soon improved, but the problem continued to plague the whole industry. The key figure in bringing accuracy to the measurement of electricity was Edward Weston (1850-1936). Weston came to the United States from Britain in 1870, partly to escape his family's hopes that he become a doctor. Instead he became an electrician. After nearly two decades spent working for others (something to which Weston was remarkably ill-suited), he set up on his own, determined to solve the problem of accurate measurement once and for all. Weston was a brilliant technician, with a sophisticated understanding of electromagnetic theory and a dogged ferocity of purpose, whether that purpose was perfecting his inventions or defending his patents. The patents were worth defending. By 1888 Weston had developed a simple but highly accurate voltmeter, which became the first product of the Weston Company. Almost immediately, Weston meters became the standard against which all others were measured. Beginning with that first product, "Model 1," the Weston company quickly branched out, producing other sorts of meters, for large and small voltages, and for use in contexts as varied as power stations and laboratories. One of Weston's inventions, the standard cell, which provided a standard measurement of voltage against which meters and other electrical equipment could be calibrated, was so accurate that it was officially accepted as an international standard. Weston was so pleased by the honor that, in this case, he surrendered his exclusive rights to the patent. Given Burndy's own association with the electrical industry—the Library bears the name of Bern Dibner's company, which was one of the world's leading producers of electrical connectors—we are especially pleased to announce that we have acquired a substantial body of material related to the history of the Weston Company. The collection, which includes instruments, company records, photographs, and ephemera was gathered by Charles Mulhern, who worked as an engineer for the Weston Company. He acquired many of the instruments from the Company's own museum, when that was dismantled in the 1970s. These are, for the most part, meters that have never been used for anything except display, and are in pristine condition. The collection includes a number of items of great rarity, including two very early examples of Model 1. One is so early that its serial number does not yet reach into four digits; at that point the meter had not yet even been assigned the designation Model 1. There are also two very early station meters, both of which represent a substantial improvement over Edison's nail. 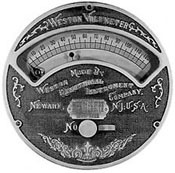 Of particular value are several early meters manufactured by the Weston Company's competitors. Comparison will reveal much about different approaches to the same problem, and why the Weston Company was so much more successful than those rivals. The collection also contains instruments used in the making of meters. These were not intended for sale, and are essentially unavailable to collectors. Most interesting are two torque testers (devices used to measure the accuracy of the coil springs that are at the heart of the meters), both of which date from the early years of the twentieth century. Absolutely unique is a large precision micrometer built for Weston by Pratt and Whitney. A masterpiece of early twentieth-century machining, this instrument was used to ensure the consistency of those tiny coils. As important as the instruments themselves are a series of ledgers documenting the Weston Company's first forty years. The ledgers list general expenses and income-the Company spent nearly $8400 at the World's Columbian Exposition in 1893-and appear to be the only surviving records of the Company's growth in its period of greatest importance. We have also acquired Weston's "model books," which served, in some ways, as the Company's autobiography. They contain a number-by-number description of the function and design of every product manufactured by Weston between 1888 and the early 1970s. There is also an extensive series of product catalogues, dating back to the beginning of the twentieth century, and a small archive of publicity photographs. This wonderful collection came to Burndy with the help of a long-time friend of the Library, John Weyer, himself a retired electrical engineer. We are extremely grateful to Mr. Weyer, and to the family of Charles Mulhern, for making the acquisition of this important collection possible. Charles Mulhern was a true collector. The fact that he had four Model l's already didn't mean that he shouldn't have a fifth. In many cases he gathered multiple examples of the same instrument. From the beginning, finding a home for his collection has been a collaborative effort. We are pleased to have shared this important part of the history of electricity with the National Museum of American History at the Smithsonian Institution and the Precision Measurement Museum of the Yokogawa Electric Corporation-the Japanese equivalent of the Weston Corporation. Copyright © 2000 -2006 by Burndy Library.